Most of the information we deliver is in a digital format, such as digital images on a DVD or GIS information delivered electronically. But you may want printed images for use with a stereoscope, or a large poster for a conference room wall, and we can create these also. As with our other services, we produce these hard copies in house and to your specification. Our standard stereo prints are letter size (8.5 x 11”), which fit in standard file cabinets. Each print is labeled with information such as time/date and location, as per your specification. 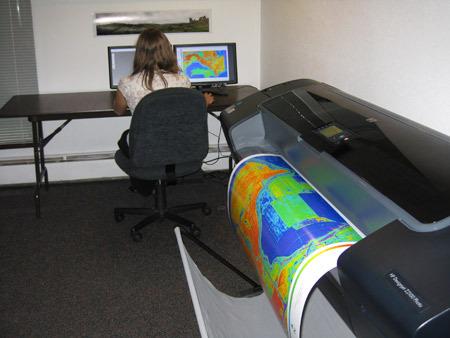 For large printing projects, we send sample prints first, and we can make adjustments such as brightness/contrast and color balance as needed to best serve your intended application. We use archival quality photo paper and ink, with an expected life of over 100 years. We have delivered small printing projects such as a dozen prints, and huge projects of over 10,000 prints. We can also get your prints laminated, giving them greater durability and water resistance for use in the field. We can print photo-quality posters up to 42” wide and just about any length. These can be useful during meetings for a visual representation of an area being discussed, and also work as a custom office decoration.